The Sapphire at Century Village in Al Garhoud district is a blend of contemporary design and various cuisines that has an ideal eating place, where food devotees can relish authentic Thai food along with variety of international cuisines. The menu of this place also includes fine assortment of refreshing cocktails, which can be enjoyed together with the food at lounge terrace of its eatery. This outdoor lounge is entrenched with exotic plants plus cascading fountains also surrounds it. Interior of The Sapphire restaurant is also well decorated with a friendly service at the bar. In brief, this venue offers incredible food in modern settings and all this in exchange for unbeatable price. Rejuvenate yourself with the scrumptious Thai fusion carte du jour of The Sapphire restaurant along with a menu that is compiled from various international dishes and recognised as Stone Grill. To wash down these luscious varieties, The Sapphire has also introduced a wide selection of refreshing cocktails. In order to entertain visitors, DJ plays soft and chill-out music at this venue. People of Dubai also get in touch with the management of The Sapphire to hire them for organising private functions or events. This includes corporate and theme night club parties as well. Special discount is also offered, but only to a particular group. Guests can also enjoy Happy Hour deal at this place. Plus, outdoor seating makes this place even more attractive and it also attracts smokers because shisha and smoking are permitted at this venue. 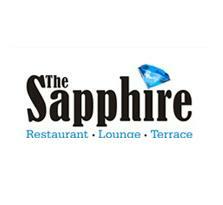 To see the asian menu, stone grill menu and drinks menu of The Sapphire, click these links. The operating hours of this venue is from noon till midnight between Saturday and Wednesday, whereas on Thursday and Friday it remains open from noon till 3:00 am, while daily Happy Hour deal last from 5:00 pm to 7:00 pm. Century Village, Aviation Club (Behind Tennis Stadium), Dubai, United Arab Emirates. Head west from this metro station and then turn left towards 2nd Street. After that make right turn towards 2nd Street before making a left turn onto 2nd Street from where continue onto 31 A Street and soon you will find The Sapphire. Dubai Tennis Club – Dubai bus stop is just 1 minute walking journey from The Sapphire, as it is located 43 meters away from this bistro. Bus number 42 serves this stop through one can easily get here. Afterwards they should head west on 31 A Street towards 2nd Street and after covering 42 meters distance they will find this venue. 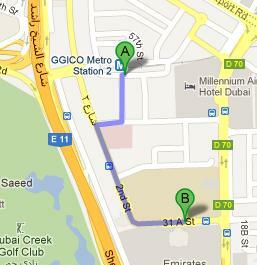 Checkout map for directions.